Bonny Eagle's Cam Gardner clashes with a Storm opponent; both boys watch a free throw head for the rim. PORTLAND—Bonny Eagle found themselves simply overmatched vs. Scarborough in the tournament semifinals at Cross Insurance Arena on Tuesday night, Feb. 20: Despite a 17-point performance by Zach Maturo, the Scots couldn’t keep up with the Storm, led by standout Nick Fiorillo with 26. 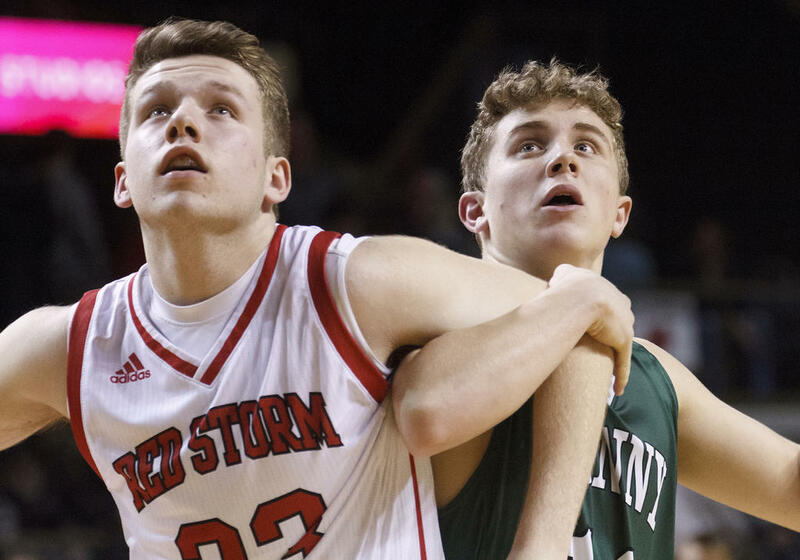 The Storm hopped on top quick: Fiorillo drained a jumper in the opening seconds, and Jaquan Seme fed Paul Kirk for two more. By the time the Scots got on the board – on a Connor Sirois dish to Will Hendrix for a two underneath – they were already down by nine. Seme and Kirk hit twos and Morgan Pratt dropped in a three before Bonny Eagle could score again – Sirois completed a three-point play with the quarter winding down. Sirois also added the first two points of the second. The Scots’ deficit stood at 10 now, 17-7, and it would expand and contract in the next few minutes, returning to 10 at 23-13 on a Sirois-to-Hendrix repeat two. Maturo drained two from the line and drained a two from the field to bring his boys within seven at 24-17; he bucketed another deuce to keep them there at 26-19. The last points of the half belonged to Stormer Reece Lagerquist, though, and the sides retreated to their respective locker rooms for the break with Scarborough out front 28-19. The Storm outpaced the Scots 14-10 in the third. Maturo reeled in seven for Bonny Eagle – that’s a trio of twos and a lone free – and Sirois sank a three. The Scots, however, sent Scarborough to the line far too frequently in the stretch: Fiorillo knocked down a three and a two for the Storm, but their other nine points all came on frees. Despite that Scarborough was clearly the better team on the evening, Bonny Eagle hardly embarrassed themselves. Their energy never wavered and they never hung their heads. The fourth resembled the first: Scarborough battered the Scots 19-6, beginning with a Fiorillo three. Hendrix retorted with a two, but Lagerquist nailed a three-point play in turn. Hendrix and Sirois each hashed two more from the line as time ticked away, but Fiorillo, Lagerquist, Seme, Pratt and Brian Austin all struck for the Storm, securing them a comfy W.
Sirois finished with ten for Bonny Eagle, and Hendrix with eight. The Scots advanced as far as they did despite facing a bit of adversity this season. Starter Nick Thorne recently retired from the court, for instance, following shoulder surgery. First-ranked Scarborough also prevailed – and by roughly the same spread – when the squads met in the regular season. No. 4 Bonny Eagle offed No. 5 Gorham in the quarters to earn their shot at the Storm. The Scots entered the bracketing at 6-12; they thus retire till next winter at 7-13. Bonny Eagle’s Cam Gardner clashes with a Storm opponent; both boys watch a free throw head for the rim. Logan Fogg looks for a pass option, attacking late in the game for Bonny Eagle. Jackson Bean shovels the ball froward for Bonny Eagle in their defeat vs. Scarborough. Bonny Eagle’s Zach Maturo tries to duck ’round Scarborough’s Morgan Pratt, midair. Will Hendrix lofts up a jumpshot for the Scots. Connor Sirois takes to the air for Bonny Eagle, looking to shunt a pass across. Scot Jake Esty ascends toward the net.